"How do I love thee...?" Poets have enriched the arts and culture scene for centuries. "Good ones" put into words the thoughts and emotions of everyday man with eloquence. They evoke an array of emotions, whether they are reflecting the human condition, or addressing events of the day. Who hasn't been touched by the words of Elizabeth Barrett-Browning? Or moved by Maya Angelou's depth? Poetry feeds the mind and soul. It also serves as the foundation and framework of our favorite songs--from hip-hop, to country tunes, to ballads. Formerly confined to study in academic or literary settings, poetry has enjoyed tremendous popularity over the years, with "cross-over" appeal. In many cities, you can hear poets read their works at local coffee houses, Jazz joints, churches, and an array of social gatherings, for people of all ages. So significant in its impact, April marks National Poetry Month. Established originally in 1996, by a proclamation from former President, Bill Clinton, National Poetry Month seeks to recognize the artistic contributions of poets and "spoken word" artists around the world. Educational workshops, library readings, creative contests, and awareness activities will be sponsored throughout the month. Accordingly, I will be sharing a few poetry selections and related posts here at Pen and Prosper in April. 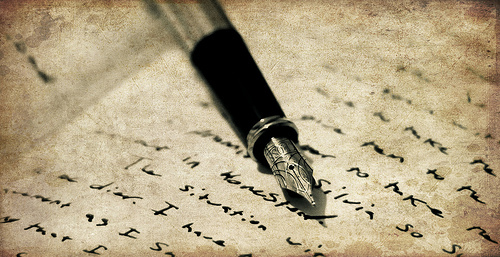 If you're a poet, and would like to be featured, please feel free to shoot me an Email at Gemsjen@yahoo.com. Pen and Prosper affords you the opportunity to reach a broad, diverse audience of wonderful, receptive readers. And the "fan base" is growing. Currently, this blog has over 10,000 page views per month. Not to mention, I love to connect with and learn about fellow artists. With this in mind, I look forward to celebrating all the magic of my first "literary love" and hope you'll join me! I emailed you but saw that for some reason my server "failed". I will Re-email you. I am celebrating National Poetry Month by writing a bit more poetry...or at least sharing my dabblings more! Thanks so much, Dawn. Lovely to hear from you on this. Thanks for this post, Jennifer. Hope you and your readers will enjoy some of the activities to be held during National Poetry Month. I love Maya Angelou's poetry, and I also enjoy reading Pablo Neruda, Nicolas Guillen and Lorna Goodison. I certainly intend to, and I hope readers will as well. This would also be a good time to explore the works of new poets and "spoken word" artists. :-) Thanks for adding to the mix here.